Nokia's dual SIM mobile phones getting so much popularity these days because of its widely usage and the main fact of many using two or more SIM's for their personnel, official, business usages. So it is a great product for them. The both models C1-00 and C2-00 supports multiple SIM functionality. But C2-00 has more extended functionalities than C1-00. Check the features, specifications and pics of C1-00 from Nokia C1-00.The price of Nokia C2-00 is marked as Rs.2500 in India. 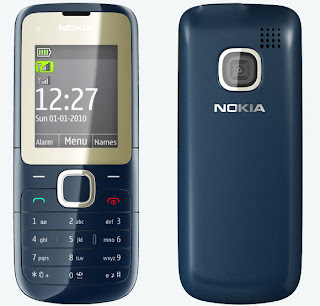 Now we see the features, specifications and pics of Nokia C2-00. Use dual SIM card with dual standby. Available in Four colors(Red, Dark Grey, Warm Grey, Cool Grey). Support for Mp3, AAC, WMA ring tones. Extended memory upto 32 GB. Stereo FM and radio recording. Battery: 240 minutes talk time and 400 hours standby. Size: 108 x 45 x 14.65 mm and weight: 74.1 grams (with battery). Sponsor: Henry Tafolla @ http://www.newbasellc.com Web Design and Online Marketing, made simple. Although a dual sim feature would be great, that would not pry me away from being an Apple junkie. I even got my iphone 4 unlocked recently and I'm loving it. If the iPhone 4 would feature a dual sim though, that would be great. I love nokia Branded mobile phones than any other brands. I feel very interesting to read post on Nokia. Thanks for sharing the useful information with us.